One of the best parts about traveling is sampling the unique international flavours of a new destination. For this, Israel does not disappoint. Though most Israelis can’t agree on what dish is the most Israeli, everyone can definitely agree on one thing: you won’t leave this country hungry. Unsure where to begin your culinary journey through Israel? Here are the top ‘must-eats’ from around the country. There is nothing that Israeli’s won’t put inside a pita. 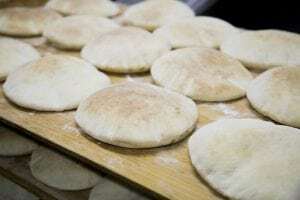 Unlike it’s Middle Eastern cousins, the Israeli pita bread isn’t thin or large. An Israeli pita is round and usually opened like a pocket and then stuffed with more staple Israeli foods. The pita bread might just be the foundation of Israeli food – it’s versatility allows it to be featured during any meal of the day, and it pairs beautifully with almost any other food on this list. 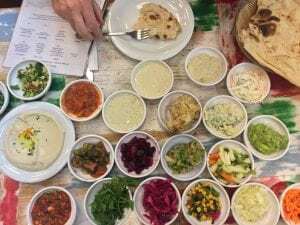 Dip it, rip it, or eat it plain, but pita is unavoidable when visiting Israel. Over the past few years hummus has become a trendy food that everyone loves. Though you can find endless variations of hummus in virtually any grocery store around the world, there is nothing better than the original. 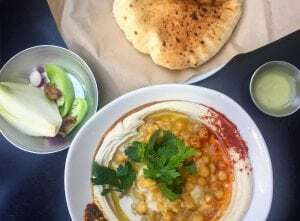 Israeli hummus is made up of a few simple ingredients blended together, but the real magic happens when it is served hot on a plate topped with foods like sautéed mushrooms, lemon juice, more chickpeas, spices, fava beans, or eggplant, among others. It is meant to be eaten as a main dish, and scooped up with raw onions or pita bread. Just make sure you have some napkins handy. Many Middle Eastern countries have falafel as a menu staple. This fried ball of chickpeas is a sure crowdpleaser. It can be eaten on a plate accompanied by salads, hummus, pita, and potatoes, or if you’re after the classic, eat it stuffed into a pita and accompanied by chopped salad, pickled vegetables, and a generous drizzle of tahini. What seems like a random assortment of foods stuffed into a pita is actually a delicious sandwich loved by Israelis. 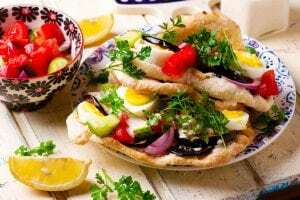 Like falafel, a pita is stuffed with fried eggplant, boiled sliced egg, salad, hummus, and tahini. If you’re feeling brave, you can opt for adding amba, a pickled mango sauce with Iraqi origins that adds spice and tang to any food. 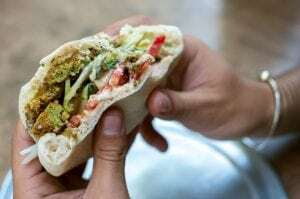 Though much of Israeli cuisine is veggie-friendly, the noticeable standout is Shawarma. You can’t miss the shops that sell shawarma on the streets of Israel; you’ll notice them first by the scent and second by the huge hunk of meat being grilled on a rotating spit. The meat is shaved and can be served as a plated dish and accompanied by other foods, or in true Israeli fashion: in a pita. You’ll probably spend more time trying to learn how to pronounce the name of this food than you will devouring it. 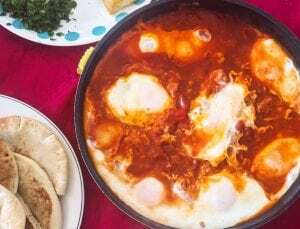 Shakshouka is a traditional Arab and Israel breakfast dish cooked and served in a large cast iron pan. It consists of eggs poached in a flavourful spiced tomatoes sauce. It isn’t unusual to add other ingredients to the mix, like eggplant, artichoke hearts, or salty crumbled cheeses. 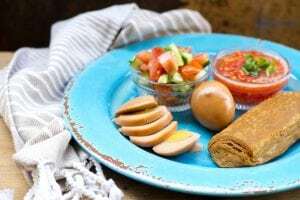 Another breakfast staple, Jachnun is a Yemenite import and classic Saturday morning food. It is prepared by rolling out puff dough very thinly, and then adding butter to every layer as it is rolled into a cylinder. Then, it is left to cook overnight. By the time it is ready to eat, it is a light brown colour and tastes sweet and flaky. It is traditionally served with a boiled egg and skhug – a sauce made of crushed tomatoes. 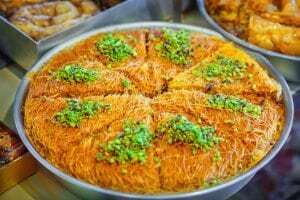 A traditional Palestinian-Arabic pastry soaked in sugar and syrup and stuffed with cheese. It is tinted orange and garnished with rose water and crushed pistachio. You can often find it in the shouks – or markets around the country. The texture is unique, as the pastry is made up of long thin noodle that add an amazing crunch. 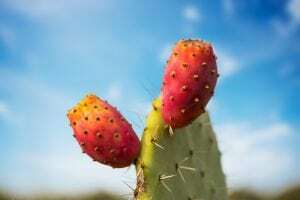 Israel’s climate allows it to grow a large variety of produce, but none more iconic to the region that the Sabra, also called cactus fruit or prickly pear. The fruit is very popular in Israel, and in fact, the fruit has taken on a national identity, as Israelis are often referred to as Sabras (some say it’s because they seem prickly on the outside but are soft and sweet on the inside). Unlike the salads you have come to know and love, Israeli salads don’t normally start with a bowl of leafy greens. In fact, there are many of type of Israeli salads, some are cooked, some raw, some are spicy and some are sweet, but all are delicious. Baba ghanoush (roasted eggplant dip), cooked beets, chopped tomato and cucumber, tabbouleh, or cooked spicy carrots are only a few examples of what you might get. It is normal for there to be a spread of dozens of small salad plates at the table with any meal for you to pick on before or with your main. Pressed for time and still want to sample all these mouthwatering foods? Contact us for help organizing a culinary tour!